Damian Lillard has earned a reputation for being one of the hardest working, confident and clutch players in the NBA. From the courts in Oakland, California, where he grew up, to being overlooked in high school and college, to becoming an NBA Rookie of the Year and All-Star for the Portland Trail Blazers, Lillard has surpassed expectations in every stage of his career. Today, Damian Lillard and adidas unveil the D Lillard 1 – the first in a line of signature products designed for the point guard, which will be available on February 6. 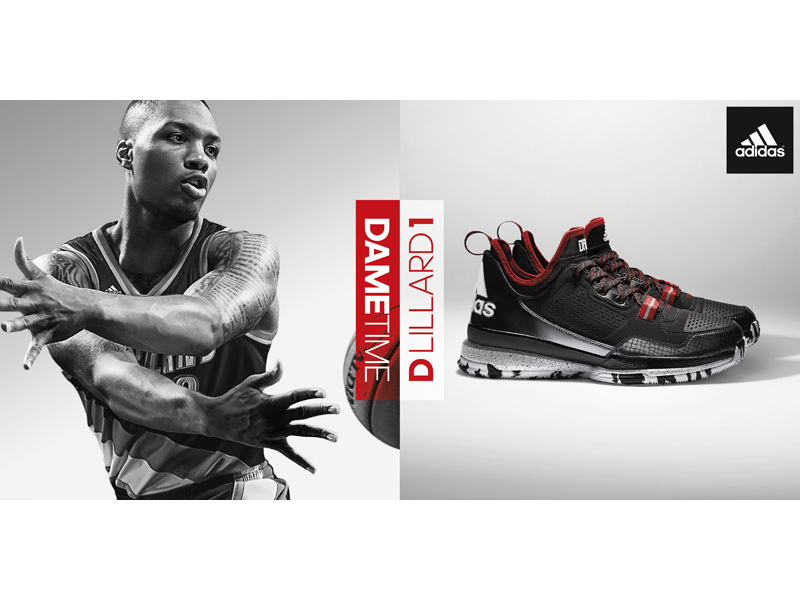 "My entire life I've dreamed of having my own signature shoe," said Lillard. "I've worked so hard throughout my basketball career and with the support of my family, teammates and fans I've been able to get to a point where I'm fortunate enough to achieve that dream. Being in Portland and having such a great, close relationship with everyone at adidas and my fans really makes the shoe representative of who I am on and off the court." To celebrate the launch and reward Portland fans, Damian and adidas held an exclusive "Dame Love the Fans" event where hundreds of fans were invited to the adidas Village through social media. The lucky fans had the opportunity to meet Damian, be the first to lace up and play in the D Lillard 1 and see hip-hop artist Future perform. The D Lillard 1 features the new Damian Lillard logo which consists of his initials, "DL," fusing together to create a "0." The "0" is Lillard's number on court, which he chose to represent the letter "O" for the three places he's called home: Oakland, where he grew up, Ogden, where he attended Weber State University, and current home state Oregon. Affixed to the left side of the logo is a wing comprised of three stripes, a nod to the nickname of his group of closest friends and family, the "Fly Guyz." "We're inspired by Damian's elite work ethic and dedication to the game so we designed every aspect of this shoe to compliment Dame's play on the court," said Robbie Fuller, Basketball Design Director. "We're lucky that Dame lives in Portland and is able to talk with us all the time. We can bounce ideas off him and really see what he's interested in and what he wants in his footwear. When it came time to design the D Lillard 1 we were able to deliver a shoe that really speaks to him as a player and person." To compliment Damian's fast, confident and complete game, the D Lillard 1 midsole features full length adiprene+ cushioning for enhanced responsiveness and superior heel to toe transition. Lillard's versatile style of play is supported by a TECHFIT tongue and inner booty that provide heightened comfort and fit. The D Lillard 1 features a new low-cut, yet stable design, allowing for optimal mobility, comfort and versatility on the court. In addition to performance elements, the D Lillard 1 features details reflective of his personality and style. These details include the Damian Lillard logo featured prominently on the heel of the left shoe, while "Dame" is written across the tongue of the right shoe. The insole of each shoe features a unique rap lyric written by Lillard that relates to each colorway. The lyrics featured on the shoes tie to Lillard's social media freestyle rap challenge, @4BarFriday. The D Lillard 1 is finished with premium nubuck and leather textures for a sophisticated look and plush fit. The D Lillard 1 launches at adidas and Foot Locker on February 6 for $105 in three different colorways. Additional colorways will launch throughout the year. You can customize your own colorway of the D Lillard 1 on miadidas.com beginning January 31 for $125.